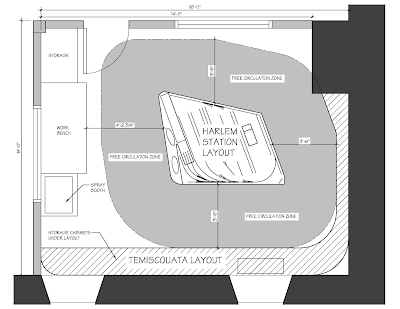 While this blog isn't very active, Harlem Station is still going strong behind the scenes. The layout itself is now in storage waiting to be housed in a new hobby room I'm planning to build in my basement. Also, I've have continued acquiring rolling stock over the year to build up the fleet. It is my hope the layout will find its new home by Christmas Holidays if everything goes according to my plan... and we know life never follow plans! Trying to fit an island layout into a new room isn’t an easy task. No wonder this kind of design has lost favor of most modellers over the years. They quickly eat up space when you take into account decent aisles where an around the wall design would be much more compact. But reality is reality and Harlem Station is indeed an island design in real life. It couldn’t have been done otherwise. Knowing that, I’ve started to look at my options and to better grasp the reality of the project, it was wise to set a few parameters that can’t be fiddled with. From the start, I decided to have aisles that would be about 42 inches wide. I know it is quite generous, but I’ve always felt the standard practice of 30” was a minimum rather than a recommendation. Operation is one thing, another is having enough space to work or build the layout… and to have enough space to contemplate our work. I see no point giving our best on a layout only to display it poorly. Once I had to determine the layout and aisles footprint, I was ready to design the room. I know for sure I want an entire wall dedicated to my workbench, including a spray booth and a computer. I have an old desk about 60” long by 30” wide that serves me well for this purpose, so let’s consider we need a good 30” wide area for these things and add some more inches for the chair. Shelving and storage will be provided and several power outlets are required. Since the basement walls are stone masonry and can’t be hidden with new finishes, this modelling station should be located on a new interior wall to make my life easier with electrical wiring. Another key aspect is the future Temiscouata Railway layout I’m planning to build in the future. This layout requires about 17 feet long to accurately replicate Connors, NB without any compression. This is a condition I’m not eager to sacrifice since I know longer believe compressing railway scenes when not required. I have also some diomara ideas, but theses won’t require a lot of space and could be hanged on brackets over Temiscouata layout staging area. A final key design element is that I have accumulated an extensive collection of rolling stock over the years and it is getting harder and harder to find a particular item among 300 or 400 boxes. If possible, I’d like to use the space under the Temiscouata layout as a storage area. It could be made of cupboard or shelving units where cars could be picked up easily. For Harlem Station, I’m thinking about using a small service table on caster to stage cars and store them under the layout. Architectural design, like any other design process, required a balance between technical requirements and aesthetics. Too often, we take a room and put a layout into it, not thinking how it will look. If Hedley Junction taught us a lesson, it’s that large aisle can truly make a layout stand out and that locating a nice scene on the peninsula, which grabs visitor’s attention when they cross the door step, is a mission statement in itself. For my hobby room, I want the same thing. The layouts should command the area and be the main focal points. Modelling is an art and should be displayed as such. I particularly like the idea of Harlem Station standing in the middle of the room, basking in light and set up on a well-crafted support. Imagine a billiard table and you’ve got a got idea of what I have in mind. Some cozy, that focus your attention on the layout as if it was a game and where it is enjoyable to spend some quality time operating with friends. As a backdrop to this, Temiscouata Railway can be seen on the exterior walls, creating a backdrop that wraps around Harlem Station. It would also be carefully lighted and supported by nicely finished storage units. Now, think about the lighting. Depending on which task you are performing, you can turn on Harlem Station independently from Temiscouata, helping you to focus on what matters. As a final touch, instead of creating a bland room, large windows will be installed in the new wall so the layout room isn’t simply a box, but rather an environment basking in light and that can breathe. Finishes will probably be painted wainscoting with trims and old colors similar to what was common in railway architecture. Not too fancy, just some character to give personality and warmth to room. In my modelling life, I’ve seen many modellers that can be considered the best of their trade. Their work is exceptional and breath-taking, however, how many times were I completely flabbergasted to see my favorite work to be literally buried in the most unimaginable mess ever. On the other end of the spectrum, you’ll also find great layouts but display in an aseptic environment basked in monotone fluorescent lighting. A part of a layout success as a lot to do with how we display it, be it in terms of enjoyment, operation and construction. You could also mount Harlem Station on castors, and move it away from Temiscouata when working on/operating the latter, creating even more free space. Simon, your comment is timely. I'm actually building the room and I had to reduce my ambition to 10' x 17'. Harlem Station will definitely be mounted on casters, it is the most viable option. I'll probably write a little more about that in a near future. I have kind of reduced my ambitions, but it should be for the best.